Q. Where is it supposed to be? This is supposed to be a coffee shop inside the gates of one of the major Hollywood studios (although which studio is never specified). Its fictional name in the movie is Café Sur Le Lot , and it is where 'Mia' (Emma Stone) works as a barista, behind the counter, as she struggles to achieve stardom. We first see her working there, waiting on customers and worried about getting to her unsuccessful auditions on time. 0:06:03: A famous actress enters the coffee shop, stylishly dressed, and orders a cappuccino, then insists on paying for it, and leaves a tip, much to the admiring smiles of Mia and her manager behind the counter. We see the coffee shop again later, at 00:38:08 (following the Lovely Night dance number) when 'Sebastian' (Ryan Gosling) unexpectedly shows up at her place of work, and she winds up taking him on an impromptu tour of the studio. The coffee shop shows up once again near the end of the movie, at 1:43:53, after Mia has become a star, and she deigns to revisit her former workplace, in a scene that almost exactly mirrors an earlier scene ( at 06:01 ) where a famous actress enters the coffee shop and is treated like royalty. Mia is somewhat smugly acting out an old fantasy ( from her barista days ) of returning to her former humble beginnings in the role of the Famous Actress. She has her hair up like the actress, is dressed in a similar fashion, and graciously insists on paying and leaving a tip… at the end, she even goes out and gets into a chauffeured golf cart/tram, almost exactly mirroring what she had seen the actress do on that early visit to the coffee shop. Q. Where was it really shot? This was indeed shot in one of the buildings at a major Hollywood studio, but it is not really a coffee shop. Warner Bros Studio , at 4000 Warner Boulevard, in Burbank, CA. But while the studio does indeed have a coffee shop (Starbucks) and a cafeteria, this isn't either one of them. In fact, it's not an actual, working building at all. 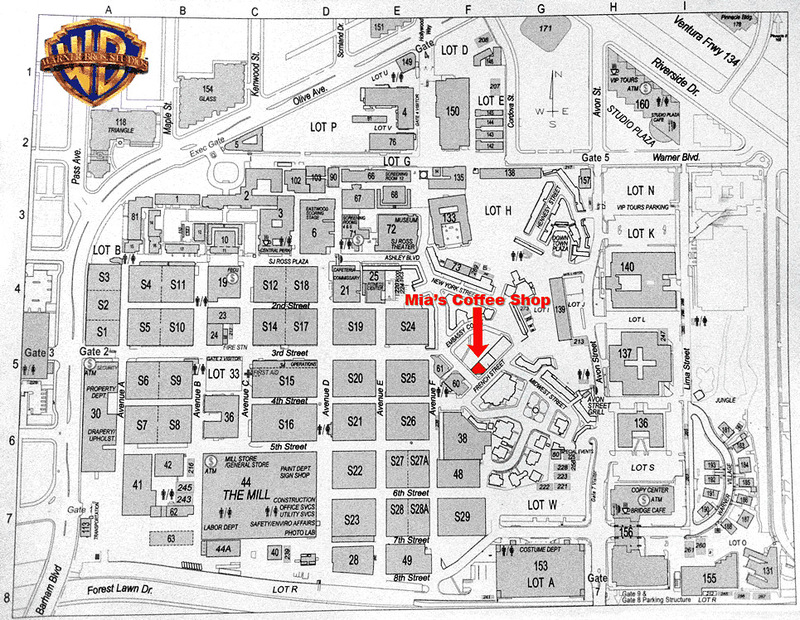 Mia's coffee shop is really just a set on the Warners back lot, a fake shell of a building used for various roles, depending on what happens to be filming. It is a small building at the southwest end of French Street, on the north side of French Street. And it is indeed right across from the 'building' where they filmed the "We'll always have Paris" scene with Bogart in the classic "Casablanca". 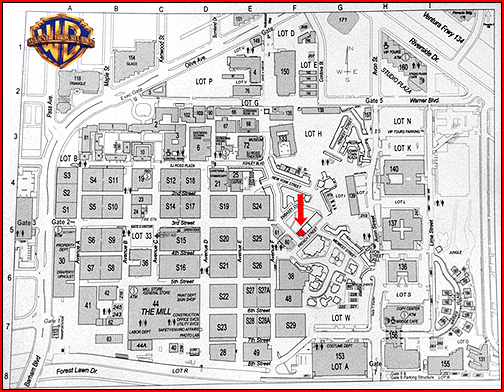 Warner Bros offers a studio tour to the public, so it's very possible to walk around this same back lot and (perhaps) see this building for yourself. with the "coffee shop" building marked. Move on to the next movie location seen in "La La Land". Or return to the Seeing-Stars home page.